Montego Bay all inclusive resorts are among the best in the world. 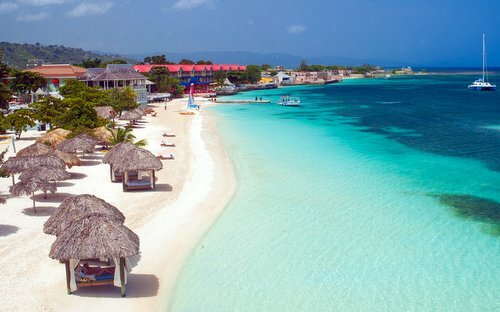 Montego Bay, Jamaica is really one of the great places for a vacation and you won't go wrong here (assuming you've picked the right resort). In a location famous for all inclusive resorts, it can be a bit overwhelming to go through the lists (and lists) of resorts and figure out which ones really are good. We've done the research and watched these resorts for years. Some fall off of the best of the best list but most don't falter. 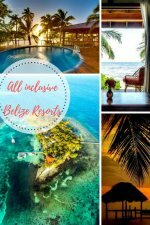 You won't go wrong with the all inclusive resorts listed below. If you haven't read up too much on Montego Bay, the following information should be helpful to you. You can also go straight the the resorts. When to Go to Montego Bay? 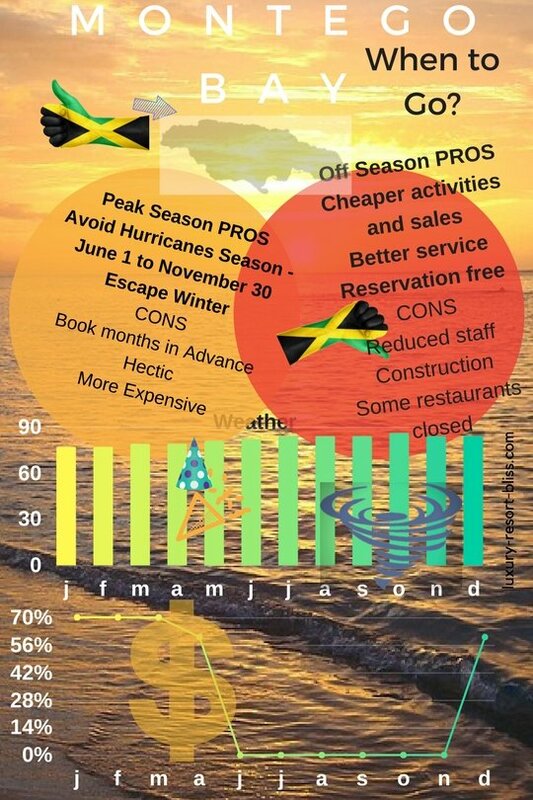 Hurricane season is in late summer, early fall. This leads to better prices but higher chance of rain and hurricanes. Jamaica however, does not get many hurricanes. Spring Break can be around March or April. Some resorts have a strict policy against Spring Breakers (and you can usually find this out on a their website). Resorts in Montego Bay (and Jamaica as well) are high quality. And we're not just saying that! They really are good. Customer service is often excellent, facilities as well and there is a lot of choice. 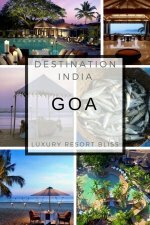 We've listed these resorts because they get excellent reviews by past guests, they have a lot to offer and they try just that little bit harder to make your stay as good as it can be. 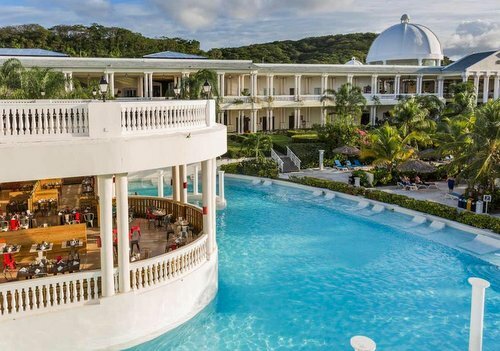 If you have stayed at some of the other Iberostar resorts around Montego Bay, you will find this one is definitely a step up from their Rose Hall properties. You get to enjoy the full range of activities available throughout their web of enterprises including scores of bars and more than 10 restaurants. This is a true 5-star all inclusive with relaxing ocean views, wide open rooms, and with access to local facilities and restaurants. The continued excellence of the service here has been rewarded with acclaims coming from a variety of tourism bodies. In recent years, this resort came in at number 5 as one of the top all inclusive resorts in the Caribbean (TripAdvisor Travelers Choice Awards). Since then, the service and facilities have remained in excellent condition. Food and beverage 24 hours. Meals and snacks are provided in buffet or la carte restaurants. More information and special offers for the Iberostar Grand, Montego Bay. Like some of the other great Montego Bay all inclusive resorts, this one has a huge selection of ten restaurants where bookings are not taken. While this does have implications which can work both ways it does seem to work here and leads to a more relaxed atmosphere. The rooms are really quite large with many backing romantically onto the pool in what is really a couples love nest. You won't see any kids around here. This adults only luxury all inclusive resort offers a lot of privacy and the opportunity for romance (lots of ways to make your girl feel important guys). hot and cold buffet breakfast. It's hard to go wrong with this one. Really good reviews as well. The original Sandals Couples Resort at Montego Bay on 26 acres of lush gardens fronting Jamaica's largest private white sand beach. 10 minutes from Sangster International Airport - this is quite close for the complimentary shuttle to bring you to and from. The planes are only sometimes audible. 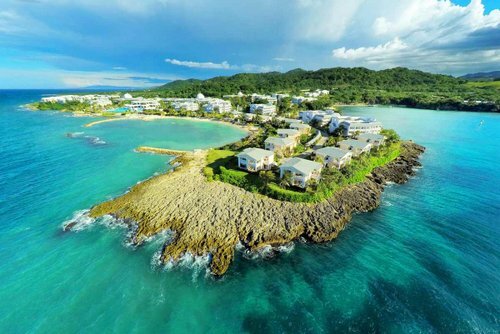 A close position for exploring Montego Bay restaurants and facilities as well. Really this is an immaculate resort in the whole designed for adults to enjoy the most of their time away. Sandals also does very well at creating luxurious outdoor spaces, both at this resort and their other resorts nearby which you are free to enjoy as well. Reviewers highly recommended this resort with beaches better some other Jamaican Sandals resorts. Staff are quick with a smile and are ready to help with the entertainment games or share some island history. Rooms: check out the Roc Estate Beachfront Villa Suites (1593 sq. ft.) with a full size sundeck. A great resort for families with lots of water activities, and a great big wide beach for the kids to explore. 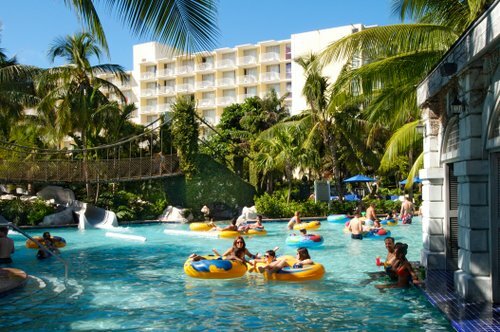 The largest water park in Jamaica is located at this resort which is the clincher for many families. A tropical paradise awaits at Hilton Rose Hall Resort & Spa, boasting an exclusive oceanfront location with access to the longest white sand beach in Jamaica. This Montego Bay resort, set on the legendary 18th-century Rose Hall tropical estate, evokes the colorful charm and hospitality made famous by the island. Here you to take advantage of a wide variety of food and beverage options during your vacation. This 4 star all inclusive on the beach in Rose Hall has been surprising visitors with the quality of service and attention to detail. This is especially true when it comes to entertaining the many families who adore this resort and come back again and again. While not quite getting the reviews of some other Montego Bay all inclusive resorts on this page, this resort does wow a lot of visitors. Also looks like visits have improved recently and families are loving it. Another excellent couples resort right next to the Sandals Resort Montego Bay. You can share the facilities with two other resort nearby. For example, this would give opportunities of dining in 11 different top class restaurants. Of all the Sandals resorts, this one gets the best feedback and is the most upscale. Rooms: at the Concierge (CS) level, guestrooms have a four-poster King bed, in-room bar and special concierge services. Suites have full room-service, marble bath adjacent to living area, and a patio or balcony. Reviews: Guests liked that the resort was smaller and more intimate than some other Sandals (like the Royal Bahamian and Grande St. Lucian). Staff are reported to be excellent and food is very good. Deal! 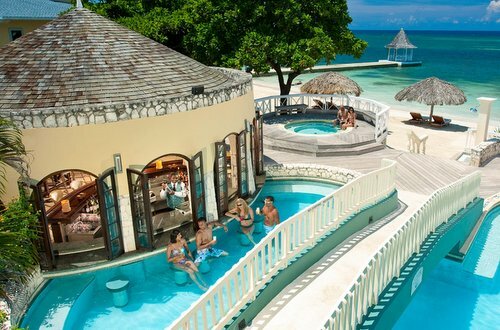 Get 2 Nights Free plus save up to 65% and a $250 Red Lane Spa credit at Sandals Royal Caribbean. Click Here! More on Sandals Royal Caribbean here.. 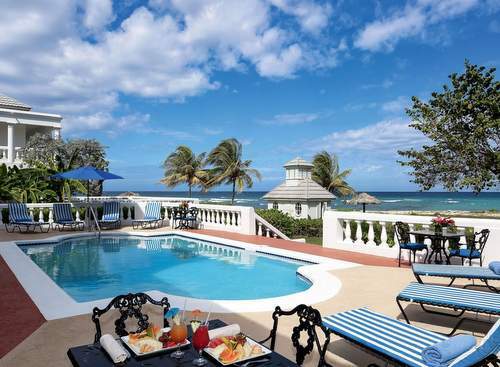 This beachfront 5 star resort is 40 minutes from Montego Bay airport in Lucea. This is a really great spot for the family. They have just finished a waterpark and have a kids club as well. Water sports tennis, basketball, volleyball and a and full-service spa and nightlife are also some of the things you'll find. Reviews of Lady Hamilton are quite good. Couples especially love this place (although we expect families to start making a strong presence with the addition of the waterpark). Some like the theme buffets but say some days are better than other. Expect the casual pace of Jamaica here! An exceptional 5 star all inclusive at Rose Hall. On 400 acres of tropical landscape on Jamaica's northern coast. Kids: They have their own children's village and have been known to let all teenagers stay for free in the summer. Good full day and half day programs. There's a good choice of guest rooms, suites and private villas. 72-hole golf course designed by Robert Trent Jones Sr.
That is a massive list for any resort! Reviews: They like to say on their website that the Castro and Queen Elizabeth II stayed here. Sounds like quite a party. They more than likely would not have had much trouble finding a place to perch by the pool because of the ample furniture. Weddings seem to go off without any serious hitches. Food is excellent and fresh and served with warm friendly smiles on the side. As all restaurants and bars are situated right on the beach, this is also a big help. An all round great all inclusive that is fitting for a queen or military dictator. Read the latest reviews for Half Moon here. This 24 hour, all inclusive adults only resort is known for its relaxing atmosphere and offers a wide range of activities. There's a spa / wellness center, fresh water pool and it's close to a number of attractions like Glistening Bay. 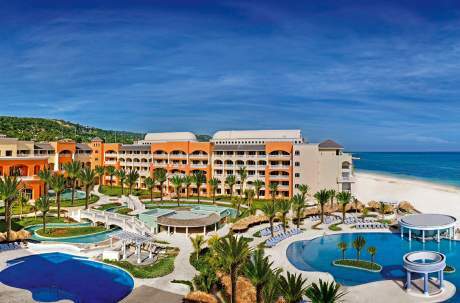 Reviews are excellent for this 4 star resort by the famous Riu chain. A good variety of water sports and activities and friendly and helpful entertainment staff. It's an all inclusive resort (in Jamaica) with Venetian architecture. Interesting! All the meals are in one location but there is a choice of the buffet or you can visit a cooking stations. If that does not take you fancy, there is always the Italian, Asian buffet, and grilled seafood / steak restaurants. 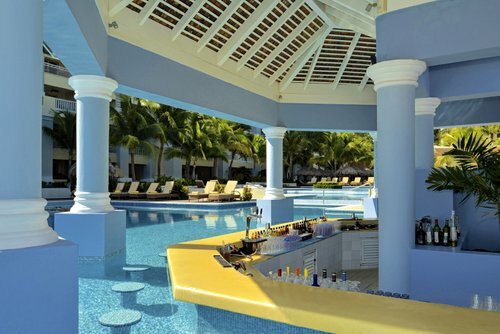 Deals, reviews and more information on the Riu Montego Bay All Inclusive. We've put together a video playlist for those who really like to see what the resorts in Montego Bay are all about. The Montego Bay all inclusive resorts playlist includes an introduction video to some of the top Montego Bay attractions. Stayed in some Montego Bay all inclusive resorts? Let others know which ones to go to (or stay away from).